It’s not too often that we in North America hear of a Russian rock band, in fact the only one that comes to mind is Gorky Park with their minor MTV hit, 1989’s “Bang”. But what other heavy metal outputs does the “Red Country” have? Well, I just discovered one called Reds’Cool. Born in St. Petersburg, Russia in 2011 they quickly expelled their first full length record entitled Attraction in the same year. Now two years later they are poised to unleash the sequel with Bad Story on October 18th, 2013. The forthcoming album consists of nine melodic rock tracks in the vein of, as they describe on their Facebook page, “classic hard rock with modern interpretation, turning to blues and art rock”. Several places report that the legendary Michael Wagener produced the record, but in a post by Wagener on the Reds’Cool Facebook page says that he did not produce it, but only recorded some overdubs, mixed and mastered it. Bad Story starts off rockin’ with, “Bite” and immediately conjures up images and thoughts of Whitesnake. “Hey You” continues the trend with a catchy little riff throughout. From there we go through the slower tempo of “Confession” before ramping up a little again for “Love and Pain”. By the time I get to “Upside Down” in every listen so far, it has all blended together and I don’t realise that the songs have changed, completely missing “Feel You”. Another slow tempo ballad appears in “You Must Go”, while “Fooling Myself” gets better with every listen. The gang vocal chorus of the shortest and arguably best cut, “Bad, Bad Story” end the recording on a high note. 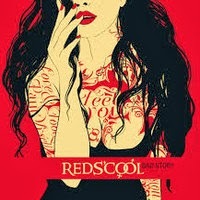 Overall I don’t see anything groundbreaking on here and while it does at times seem to lack some “balls”, Reds’Cool has put together a fairly solid collection of radio friendly tunes great for fans of Whitesnake, Brighton Rock or even Bad English. I recommend full volume for your total listening enjoyment.